Fast fix! 32 bit compatibility restored!! Great app! Builds skills quickly. Logical GUI. Easy to configure custom exercises. This app is amazing for working on sight reading! I use it to practice and to teach private lessons. It has a very intuitive user interface and is an extremely effective tool for improving your sight reading chops. I highly recommend it for all music teachers and music students. I am actually learning how to stay on beat (not ahead or behind!) and read rhythm thanks to this app. These were both major goals for me as a relatively new bass player. Thank you to the developer for all the time you’ve clearly put into this app. There are incredibly extensive exercises in every time signature imaginable. I love being able to quickly adjust metronome setting and choose between being tested or just practicing, both of which offer different supporting sounds. Visual feedback is superb. I like that I can stay at any level of challenge for as long as I want. I highly recommend this app! 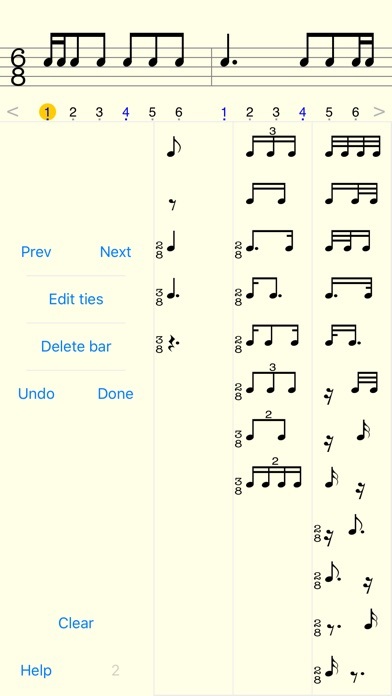 You'll need a basic knowledge of musical notation to use It, but this app is great. The interface and structure are clear and pleasant, and the lessons build upon each other very well. I've really improved after a couple of months use - and have a long (long) way to go with it. This app is just great. Perfect from anybody from beginner to advanced levels. My rhythm reading has improved so much without me even noticing it and it's all because of this app. The icing on the cake are the updates. With every update there's always a very useful feature. I'm looking forward to download more apps from this company. This app has made it possible for me to work on my groove even when I'm away from my instrument. I'm a bass player, and groove is everything. This app gets a five stars for having tons of exercises and for being so easy to use. Thank you for creating this! I've finally found a replacement for the old Tap Master Rhythm System by David L. Shrader. This is it! This app is great for learning rhythm and very well-thought-out. It's super simple to jump into an exercise; just open the app and you're ready to go. The exercises are highly varied but the description already tells you that. Another thing you can tell from the description is that it's packed with features and options. I found them all very useful. However, the app works fine without needing to fiddle with the options. Discover them at your own pace (that is, whenever you decide to peruse the menu). The best part of the app is that it's free and ad-free and still getting updates! Definitely try it out! I USED to like this app. Now, not so much. It seems the acknowledgment of taps by the app is delayed. When I tap, there is a noticeable delay between the when the finger taps the screen and when the software indicates the user placed it. I use this app for teaching and for personal time and reading training. A must have in my musician tool box! Wonderful, very customizable to many different levels of skills. Really great for the money! I had an earlier 2012 version of this app for iPod touch. I'm using the 2016 version on the iPhone 6s now....although the touch latency is improved on the iphone6s compared to the 2012 iPod touch, there is still a noticeable amount of delay. You have to adjust accordingly. Maybe as technology continues to improve future versions will not be affected as much. Another major issue I have with this app is the durational aspect of rhythm is completely ignored in this app. For example: a quarter note and an eighth note followed by an eighth rest would have the exact same user input according to this app but if played by an instrument like a guitar or a horn, they would be treated entirely differently. The quarter note will sound twice as long. I recommend this trainer to all my musician friends and students. It is good to have a couple of the basics under your belt before you start, but even if you are a near beginner--the adjustable settings are great. The visual feedback after a quiz isn't too picky in my opinion. Are you always a little too late on an anticipation in the app? Could be on the bandstand too... This is a top-ten music app on my devices. I've been working with this app now for over a year and my time, rhythm, and reading has greatly improved. I've recommended this to several other musicians of all skill levels who need to improve in these areas. I usually set it to endurance and expert modes with two-handed tapping to work on specific levels of difficulty. My only request is to have more control over tempos for endurance and expert modes so I can gradually move to much higher tempos and difficulty within the same level of exercises. I wish i had this when i was studying music in college. We had only books then. The exercises make practicing fun. My only critique is that you have to dig around in the settings to find all the great features. 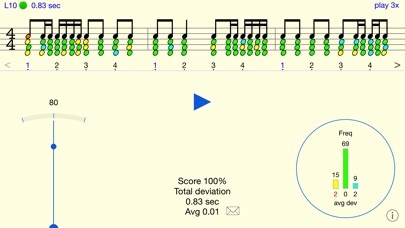 I want to be better at playing my guitar and this app is amazing for building rhythm. I downloaded it less than 24 hours and gone from having no experience or understanding of rhythm to feeling I already have a built a foundation that I can continue to progress forward on. So much fun in tablet and phone! Couldn't stop playing with it! Wish they add more exercises!!! 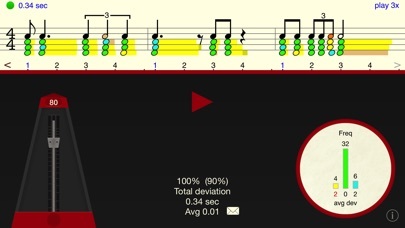 This is a well-designed app for practicing rhythm by tapping and getting immediate feedback. There is a large variety of practice rhythms. 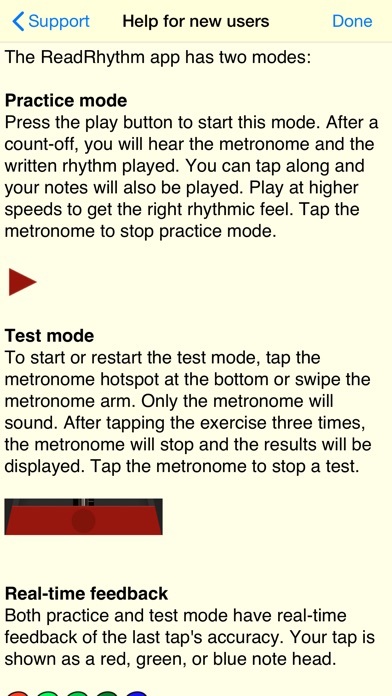 I personally struggle with not holding longer notes long enough and with not staying perfectly with the metronome. I'm working with the app 5 minutes/day, and it is improving my rhythm skills. Thank you. Doesn't do a ton... Just gives you exercises and provides immediate feedback as to how you did. However, if you're dedicated, and you work with this, it can really improve your reading ability. It would be nice If the exercises were broken up in to categories, or there were some way to choose how you were approaching various trouble areas... Maybe in an update? For $2.99 this is a very good app. The app is super configurable and has a lot of practice options. I accidentally had a setting wrong and the endurance exercises kept resetting to 80 bpm. I emailed support and the told me, nicely, to check the metronome setting to make sure it was manual. That fixed it! Great app for anyone interested in improving in rhythm. Really nicely designed app with a huge variety of exercises covering practically every possible rhythm imaginable. 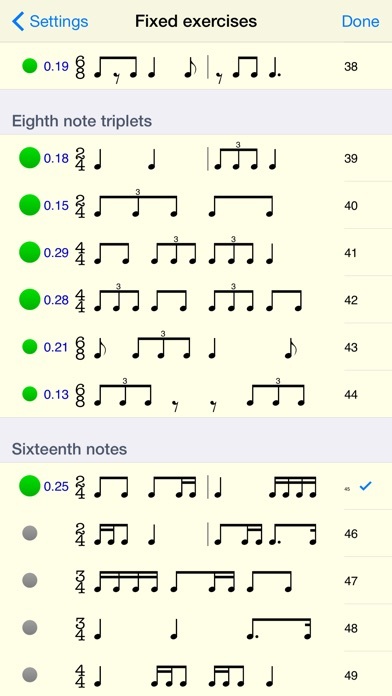 I like that you can easily choose exercises covering the type of rhythms you want to work on (i.e. 16th notes with ties in 3/4 time). Not sure where to begin. This app is so simple yet so difficult. If you have an issue with your timing this app will correct it. If you need to learn new rhythms this app will guide you. This app will point out your problem areas and give you the tools to make them right. Must have for any drummer and bass player. I love this app, and try to use it just a few minutes every day. I'm thrilled with the huge number of time signatures, rhythms and love getting feedback on timing accuracy. It's a great buy for any musician: student, hobbyist or professional. A must have for every musician. I love how it looks. I figured it out right away how to get started practicing my rhythm for piano playing. There are advanced settings if you want them but I liked that I could jump right in and start practicing. And can't emphasize how much I like the clean and beautiful interface. This is a very useful and fun app for learning to read rhythm notation in music. I also find it very challenging. There are all kinds of options for making it work for you like being able to create your own patterns or selecting individual bars to repeat and practice. They will also have two measures in sequence that sound the same but are noted differently, with one representing all beats (the way it should be) and the next not representing all beats (the way it often is noted in sheet music). I almost gave it four stars because I think some of the setup screens are a little confusing. But overall, this is worth much more than it actually costs when you factor in how rapidly your skill level can improve. So I think it deserves five. Just fantastic. Good price, great flexibility, low latency, etc. Great immediate feedback to student, and I love that they can send reports in to my teachers and me. Kirk Hanser - Childbloom Guitar Program. The app is consistently updated and offers a versatile user-friendly GUI that allows you to fully utilize it's awesome capabilities. This is one of those applications that I will never delete. It has helped my rhythm for guitar and drums immensely. I would recommend this to any beginner or advanced professional looking to sharpening their skills. Exactly what I needed. More than I expected Addicting! A great way for any musician to develop rhythm skills in a tangible way. Any musician who thinks they know rhythm needs to sit down with this and play. I'll bet you'll be as surprised as I was. And as happy to have found it. ReadRhythm is by far the best and most powerful rhythm training app I have ever seen on any computer or device. Except for the fact that it's so powerful that the options setup can seem a little daunting to the new user I can think of nothing that could be done to improve it. For any musician wanting to delve into getting to know their own tendencies this is great. Great tool! This is ridiculously inaccurate and maddening to play. If you are looking for any remote rhythmic accuracy, look elsewhere. I have a doctorate in percussion and it makes my skin crawl to try to get the green accuracy dots to appear. The only way to do that is by being totally inaccurate with the rhythm. This is a really good app for improving rhythm. This app really has a lot more capability than I expected especially with all the extra challenges. Well worth its price. Seriously. This is a great app for learning IF you read the instructions. If you don’t, you will hate it. The developers would benefit from one of those quick 5-screen intros when you open the app. Otherwise I love this tool for teaching me to count music and KNOW if I’m right or not. So hard to do while playing my violin on my own.